Where do the names of the characters in the Missing series come from? Lauren is simply a girls name that I didn’t associate with anyone I knew – and that I really liked. Jam is short for James. I’d read a lot of books with that name for the male main character and I wanted to find a fresh twist on what is a very popular choice for boys. When it came to naming Madison and Shelby I looked to the United States, where both sisters grew up. My criteria was simple. Madison needed a name I liked. Shelby needed a name I didn’t! For the new people introduced in Missing Me, I picked names that hopefully reflect the character’s backgrounds. Esme and Wolf were chosen because they are elegant, upper-class names (at least in my mind!) Wolf’s first names are Wolfgang, William… after Mozart and Shakespeare, as he explains to Madison in the book. His father has given him a lot to live up to with those names – as is shown in the relationship between the two. What made you pick the locations you used for Missing Me? Lauren’s home was always north London, so it made sense that when Annie brings Madison to live in England after the events of Sister, Missing she would choose to live nearby. I set the original Missing books in north London because that’s where I live, so all the references were on my door step! The action of Missing Me takes place in various locations in London. I used the Houses of Parliament because I knew it was a venue where security would be high, which I needed for the story. I have visited a number of large houses in Hampstead, so was easily able to imagine Declan Baxter’s mansion. When it came to the locations outside London, I sent Madison to Cambridgeshire because I was there on an author visit while I was planning the book! As for the cliff top finale. This wasn’t based on any specific part of the coastline, but I love the sea and I’m always happy when I can set a dramatic scene beside the ocean. You can read my review for the first book in the series, Girl Missing here. I'll have reviews for both Sister Missing and Missing Me up later today! 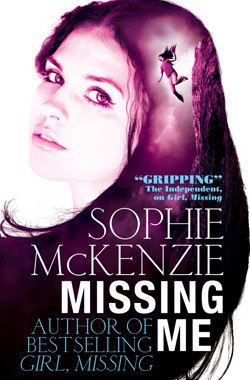 Missing Me is published 13 September 2012.